It’s a great time of year to adjust the thermostat. One of my favorite concepts I have heard recently has to do with a thermostat. It seems appropriate now as the temperatures fall in Ohio…but it’s not THAT kind of thermostat. It’s a personal thermostat. Ed Mylett says that each of us has a personal thermostat. It is set to a certain “temperature” that is determined by what we think we are worth. So if we think we deserve a 75 degree life, we tend to keep our thermostat set at 75 degrees. The good news is, if we fall on hard times (and our temperature drops) we will work hard to get that temperature back up. The bad news is, if things start going really good (and the heat starts to rise), we will likely start to cool things down. This is when we find ourselves outside of our comfort zone…we naturally want to get back there. So how do we “fix our thermostat?” Mylett says there are two ways. Change Who You Hang Around With: Jim Rohn said that you are the average of the 5 people you spend the most time with. It’s true. So if you want to increase your thermostat in life, spend time with those that are at a higher temperature. If you are regularly with 100 degree people, you will find yourself being more comfortable raising your heat. Change Your Actions: I love this one because it’s totally in your control. You just have to get over the voice in your own head. So if you normally think 10 sales calls is the max you can do in a day, make it a goal to do 100. Maybe that seems absurd. But if you can increase your activity level and show yourself you can do it, it can help you tell yourself a new story. 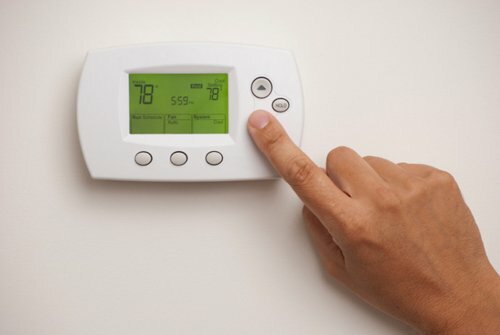 If you continually do things that people at a higher temperature do, you will soon see your thermostat begin to change. So what is the area in your life that you want to change the thermostat? Where do you want to change? Start looking at the people in these areas that you can spend time with and the actions you can take to push you to the next level. Now is a great time to join thousands of people that are looking to increase the setting on their thermostat! Join our VIP newsletter here. We send one email per week to give you all of the content we create in once place. How you start each day matters. No matter who you are, taking control of your thoughts and emotions during the first waking moments of your day can have a huge impact on your life. It impacts you thoughts and emotions, which ultimately helps to improve your productivity, choices and happiness. It’s huge. That’s why I am constantly looking for good things to put in my head first thing. It’s a part of a very intentional routine (you can listen about that on the DMJ pocast here). Today I want to share a cool video, podcast, etc. that you might enjoy as well. I am a fan of Ed Mylett. If he sounds familar, I have mentioned him here before. But recently Ed interviewed Dean Graziosi and it fired me up! I highly recommend watching or listening to this interview…but here are a few takeaways that inspired me. 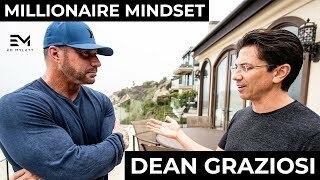 You Don’t Have to Have It Figured Out: Dean tells the story here of how he started his infomercial business. He set up the camera crew and was so nervous he had them come back the next day. He didn’t know how to edit the piece and then he didn’t have any idea on how to get it on the air. He didn’t have it figured out. He figured it out on the way. You can too. Pay the Success Tax: What if your struggles were just part of a “tax” you had to pay to show you were willing to put in the work? Dean talks about the idea that these setbacks are a part of every journey and how you can change your mindset about them. Powerful. Create Bigger Problems: This was probably my favorite concept in here. Ed and Dean discuss that most people have small problems. Yet the stress in your life is still there. They assert that the stress in big problems and small problems are the same. If you want bigger success, you need to strive for bigger problems. This was an eye opener for me. These are just 3 takeaways. If you want to be inspired, or start your day off right, I encourage you to spend the time on this piece of content today! Enjoy! One way to fill your brain with good each day is to subscribe to our VIP list! We send out the daily content from this site once a week…then you can catch up when you want! Sign up here! We all need to be inspired sometimes. There are going to be days when you don’t “feel like” doing the work. So I am constantly on the lookout for things that fire me up. That way, when I hit that spot (and we all inevitably do) when I don’t want to do anything, I know where to go to find some motivation. That’s what led me to this interview. On this Impact Theory interview with Tom Bilyeu, Tom interviews Ed Mylett. This was my first introduction to Ed Mylett…and wow! This was impressive. There were several takeaways from this interview that were powerful. 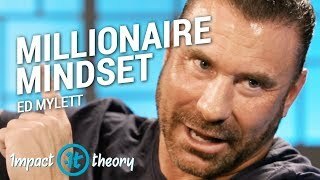 But probably my favorite is the idea of “keeping promises I made to myself.” Mylett and Bilyeu talk about ways to increase your success and to make an impact throughout the interview. But one big takeaway from Mylett is that you need to change your identity and your expectations from life. In order to do that you need to increase your self confidence and your self worth. Makes sense right? When asked how to increase your self confidence, Mylett talks about keeping promises you make to yourself. If you want to get in better shape, you need to set simple goals for yourself that you can check off the list. If you want to make more sales, you know the activities you need to do. They are simple…not easy. But when you do get up and do the workout, it creates a sense of worth in you. It raises your level of confidence. It’s not an outward activity. It is you keeping a promise to you. By doing this over and over again, you create habits that will help to propel you toward your goals. I love it. My recommendation? Spend the time and watch this interview. I have. Now I am looking for other material from Ed Mylett so that I can motivate myself on the days I don’t want to keep my promises. Make sure you never miss an update or a chance to be inspired, sign up for our VIP newsletter here.